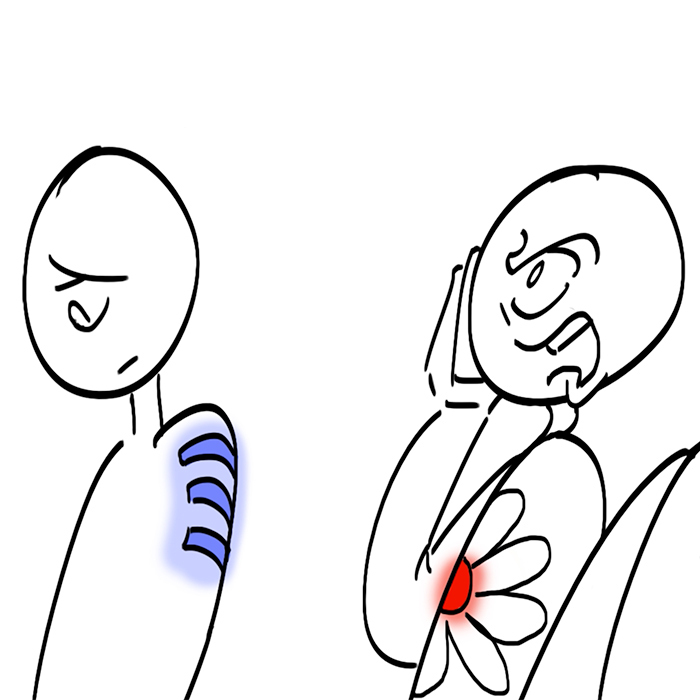 The animatic, in which someone living in the world of FashionTech denies the feelings that are clear on their chest. Made over the course of one week. In the future of FashionTech, fashions with wearable technology that show how they are feeling, designers have two distinct roles: Designing the FashionTech and designing the ways around FashionTech. Designing FashionTech requires more than just fashion sense. In my video, FashionTech was shown through clothes that displayed emotion through colored lights. There is much design possibility in there — where do you put the color, in what shape is it in, why, what does it mean, what is the intent, etc — but the possibilities go beyond that one form. For example, in the References post, there is a dress that turns invisible when the user is aroused. While not all clothes need be so extreme, designers could create clothes that directly change according to emotion, and would have to think of the best way to show such emotion in the easiest-to-understand way. For example, perhaps if someone gets angry or irritated, the clothes they wear morph into something full of sharp points and edges, making their mood visibly clear at a glance. Designers would constantly have to think of new ways for clothes to physically show emotion, and might have to think of what each emotion would really look like. Designing around FashionTech would also be prevalent. After all, complete honesty all of the time can be very inconvenient, so “cheats” or “jailbreaking” could be in high demand. But it does not need to be just manual modifications of clothes. Perhaps FashionTech could be designed with the purpose of making the color subtle, making it just noticeable enough to be seen but not noticeable enough for someone to keep looking at it. FashionTech could also be built intentionally with a system that focuses on making you appear happy and amiable; i.e the sensory range is broadened so that it is easier for the user’s emotion to be classified as happy. Is this a future I wish to be a part of? Yes. It would certainly be intriguing, and while I can see how FashionTech could lead to awkward or unwanted situations, I can also see the grand use of it. Imagine being able to just show other people that you are sad or mad, instead of keeping it inside of you or being unable to say something. It can be hard for people to express their emotions, even if they really want to. For their clothes to do it for them would be incredibly useful. To make communications between humans so much more easier would be a dream of mine. Not to mention, a world in which everyone walks around with changing colors and interesting fashions to house those colors would be a visual wonder. Such a future would require the fashions with wearable technology to become refined enough so that they may be mass-produced, and then big clothing brand names would have to try out selling these fashion with wearable technology, and it becoming popular enough to become mainstream and a part of people’s everyday lives.